Are you a fan of Indian food? How big of a fan? It seems as if the moment you mention Indian food to anyone, images of curries and naan are evoked and not much more. Perhaps a glass of lassi or some chutney also crosses the mind. Even I must admit that if it had not been for my past work with a couture events company that primarily did Indian weddings, I would not have known about other types of dishes or the wonders of bite-sized chaat. There aren't places around that focus on this subsection of the cuisine. Someone on a quest for Indian food will likely find two polar extremes from the buffet/cafeteria-style set-up to the white-tablecloth fine dining. 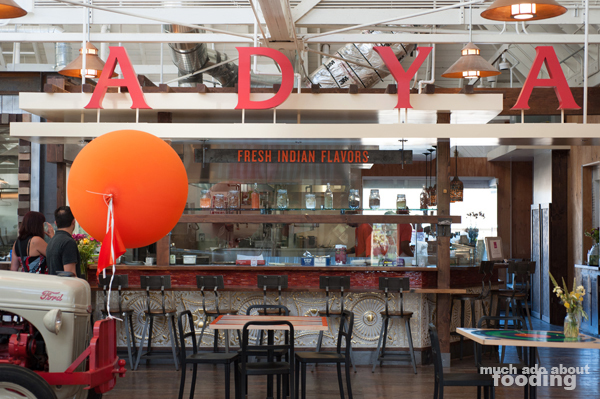 With the opening of ADYA at the Anaheim Packing House though, we now have a savior and an introduction to the unexplored world of street food with a contemporary style via the skills and vision of Chef Shachi Mehra. The name ADYA can be translated into several meanings - "the first," "the original," or "the origin of the five senses." It is an apt description of the restaurant that may be the pioneer for the Indian food experience, serving up traditional dishes with some Californian influences. 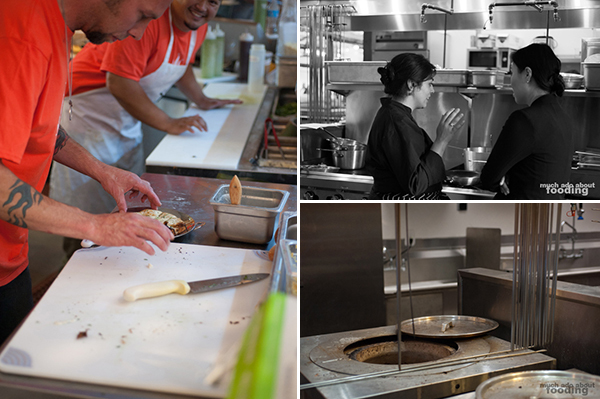 As with most of the other tenants in the building, ADYA looks to using the power of the ingredients themselves to enhance their fare, and a large part of that strength comes from local and sustainable produce. 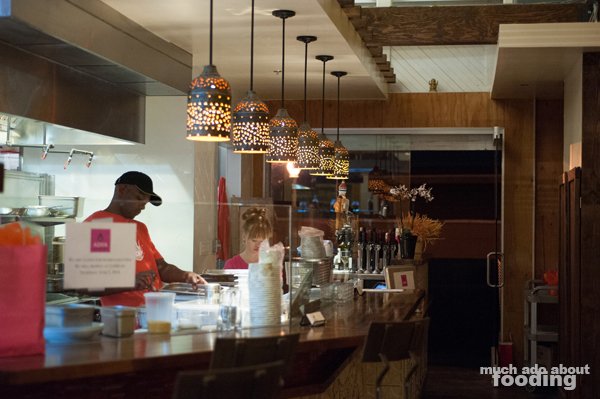 The restaurant is casual enough in decor and environment to make anyone feel comfortable, and the food is, quite frankly, solid comfort food. Though the kitchen looks claustrophobically small from the outside (you can look in from the front), it is highly efficient in churning out the beautiful dishes and even houses the star "utensil" - tandoors. "My focus is on street food of India from all over the country, not just North or South or East or West." As completely expected, a long lineage of "appetizers" came out first during our tasting. Malai Tikka ($10 - chicken breast, yogurt, cilantro, cream cheese), Tandoori Shrimp ($12 - shrimp, black pepper, coriander, lemon), and Lamb Seekh ($10 - mint, cumin, ginger, cilantro) Kebabs were served and normally come with chutney and laccha pyaz. The marinated chicken breast was tender, slightly tangy from the yogurt, and quite good both with and without the chutney. The shrimp ended up being my favorite for its strong peppery personality and thick juiciness. However, many from the table went back for seconds and thirds of the lamb which had a heat of its own; this one could unidentifiable by a person since it was ground and shaped into tube-like figures, created by the "seekh" (skewers used in the tandoor), but don't be afraid to consume these mounds. Mehra's Bhel Puri ($5 - puffed rice, cucumbers, tomatoes, dry mango) was unfamiliar to me but easily my favorite of the whole starters servings. Each portion of this dish which looks like a cheesy chopped salad had its own unique texture which played a part in the orchestra of flavor. I truly enjoyed how crisp the puffed rice stayed despite the whole dish having been tossed in a sauce/dressing. Prepared in a Bombay/North Indian style, this one had chutney rather than raw mustard oil. Crunchy, refreshing, and savory, the bhel puri is a star. Then was the Goat Cheese Naan with Tomato Chutney ($6 - stuffed with Laura Chenel Chevre and black pepper), a predictable favorite of the gathering, all of whom gobbled it up without pause. The naan itself was well-puffed and soft; match that with some fluffy goat cheese and you have yourself a comforting stuffed pillow of mellow cheese. 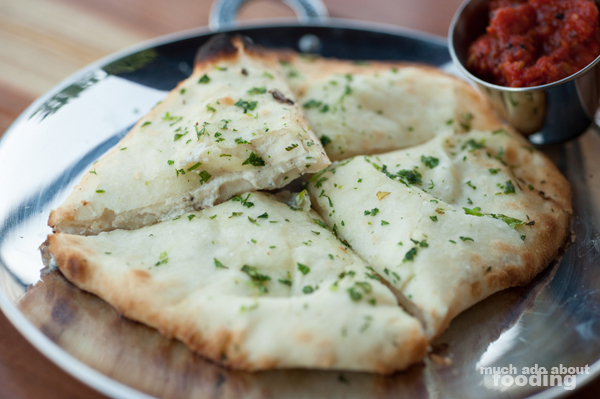 The tomato chutney (made with pickling spice of fennel, fenugreek, and mustard seed) was a welcome addition for its sweet savoriness; combined with the naan, it reminded us of (dare we admit) a simple fresh pizza out of the oven. Despite the two prior dishes being fantastic, the actual overall favorite of the entire group was the Chickpea Chaat ($6 - spiced chickpeas, tamarind, yogurt, chickpea confetti) or as some called it, the "Indian Nachos." Covered in a blended sauce of chutney, tamarind, and yogurt, the chickpea crisps lasted well enough to provide a satisfying crunch to every bite. The flavors were multiple and unfolded in bursts in the mouth - spicy, sweet, tangy, sour. It was a masterpiece in a bowl but so coy and unassuming in presentation. Then came our head-turning Pani Puri ($6 - spicy tamarind water, potatoes, mint), a common item that I used to see several times at my past work. It captured others' attentions because the crisp open shells look like jewels upon a platter. These particular ones contained potatoes and mint and were an explosion of flavor once you had poured the sauce inside each "cup." 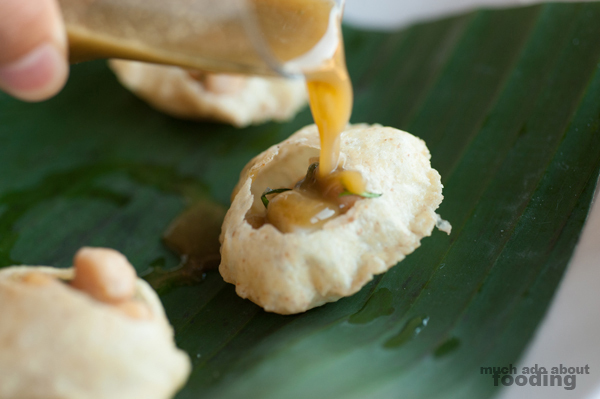 Tangy and crisp, the pani puri is a dish that many eat on the streets of India as well, shell by shell, right in front of the vendor's cart. 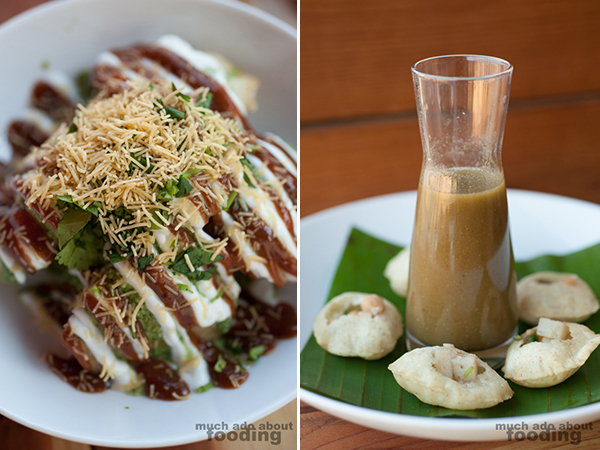 "Most dishes come under chaat (means to lick) so it makes you want to eat another one because so many things happening at once; sweet, spicy, tangy, salty, multiple textures." 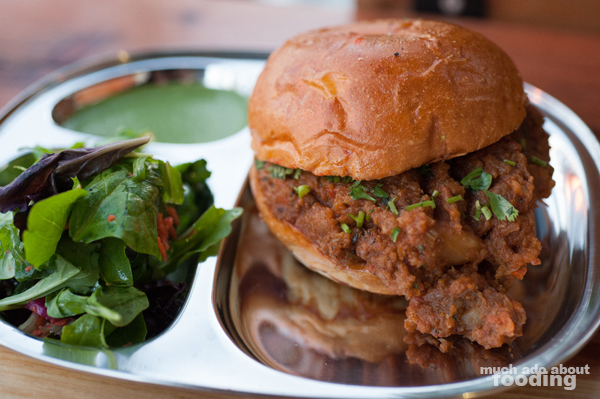 Moving onto the entrees, our first exposure was to Chef Mehra's favorite dish: the Pav Bhaji ($5- Bombay-style spiced veggie "Sloppy Joe" flavored with cilantro and dried mango). This was the inaugural introduction to the chef of Indian street food, making her think about how inaccessible the cuisine was in Orange County. Made with OC Baking Company bread, it was quite savory. I enjoyed the texture of a "Sloppy Joe" (if you could call it texture...) because this one was vegetarian instead - it was smoother, spiced more, and quicker to dispense of. 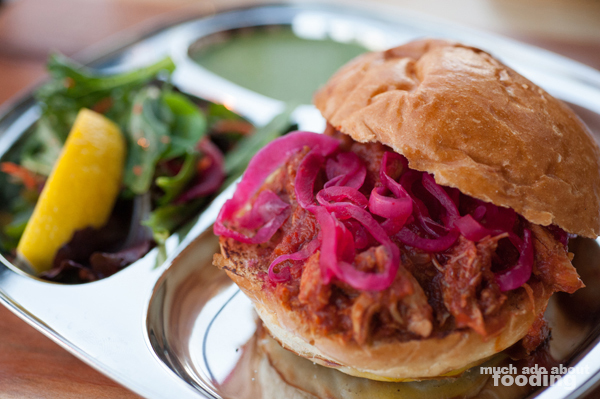 Next was the Vindaloo Chicken Pav ($6 - spicy pulled chicken, vinegar, chiles), a creation by Mehra to combine her love for chicken vindaloo with a casual street food-inspired menu. She discovered that it would work in sandwich form after eating some vindaloo alongside a bun. This was sweet but bordering on mushy from how long it had been cooked. Afterward was the Paneer Roll ($7 - grilled paneer, peppers, pickling spice) with the optional egg cracked over it. 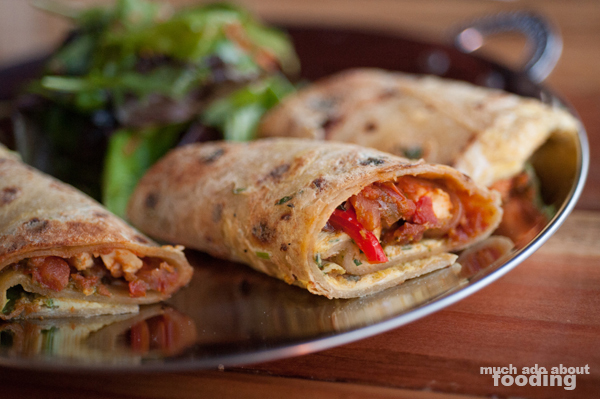 There will be at least four different types of paneer rolls once ADYA is in the groove of things after opening. If you are unaware, paneer is a special cheese used often in Indian cuisine and can warm without getting soft. Its ability to not melt makes it the perfect vegetarian rolls. These were excellent as well and easily my favorite from the sandwich section for the mash created once you bite down onto the paneer which absorbs other wrapped ingredients. The grilling gave it a slightly smoky taste that paired nicely with other spices. Last on the savory list was the combination presentation of Old Delhi Style Chicken, Dal Makhani, Avocado Raita, and Garlic ($4) and Butter ($3) Naan. 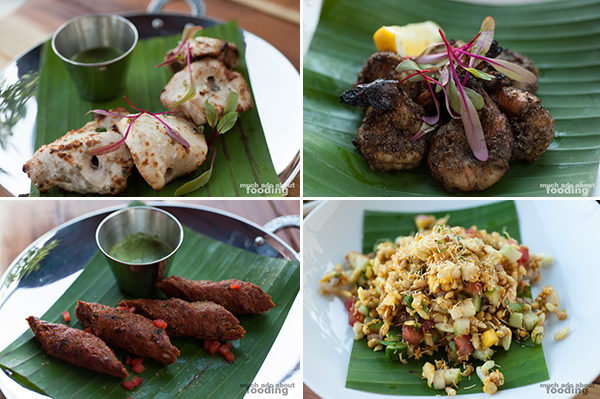 These were one-of-a-kind dishes that took advantage of slow cooking processes and are part of the rotating curries ($4 each - changes frequently). I can easily assume the thick and creamy chicken to be the ideal curry for home comfort. Since they were served in appropriate thalis, it seemed greedy to grab one and spoon a lot onto my plate of it but the chicken was one of those type of dishes. What also got a lot of attention were the black lentils (Dal Makhani). Mehra shared with us that these take 12 hours to cook. They soak overnight in water before being cooked. The first staff member to come in is responsible for starting the lentils in a pot, and everyone else is required to take part once they started working too. As she points out, "Everyone is responsible for stirring the pot. You walk by, you stir." These were hardly seasoned, containing only tomatoes, garlic, butter, ginger, and fenugreek, and yet very flavorful. As for the raita, what a neat combination that works well between buttery and tangy. 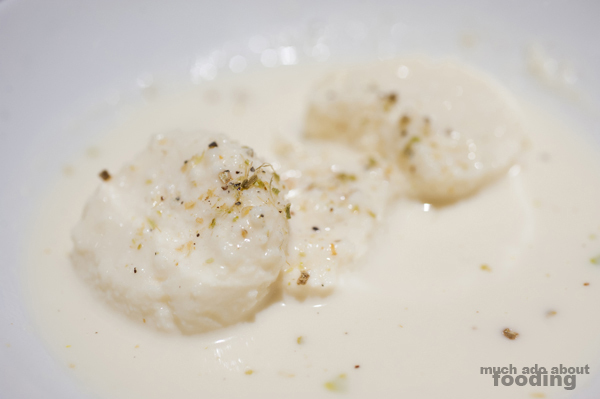 Luckily, avocados are aplenty this time of year in California, and Mehra's creation is only to be found at ADYA. The finish to the meal was the desserts. We had the Spiced Molten Chocolate Cake ($5 - with seven different spices - white pepper, ginger, coriander, and others) and the Ras Malai ($4). The cakes presented well and once cut into, unleashed a flowing stream of chocolate. 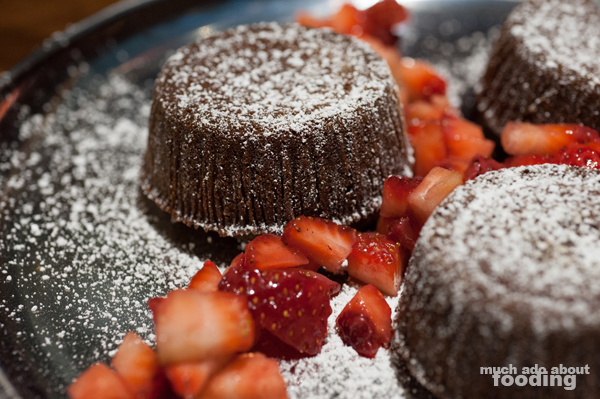 The spices kept it light and showcased the Indian influence in a typically common dessert of molten chocolate cake. As for the ras, I have always adored paneer so seeing it is usually a good sign. What I haven't seen before is it being used in something sweet so this was a pleasant surprised. These were compressed and let to swim in a pool of creamy rose water. They were incredibly soft and fragrant. 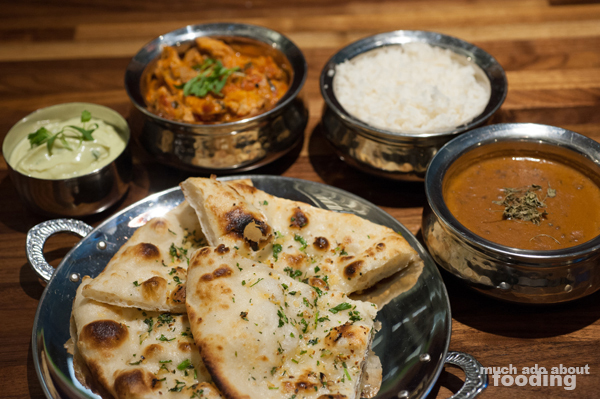 Opt for this ender if you prefer light and easy, and finish the evening with a warm glass of Masala Chai ($2.50). We truly enjoyed our experience that evening and know we'll be back. 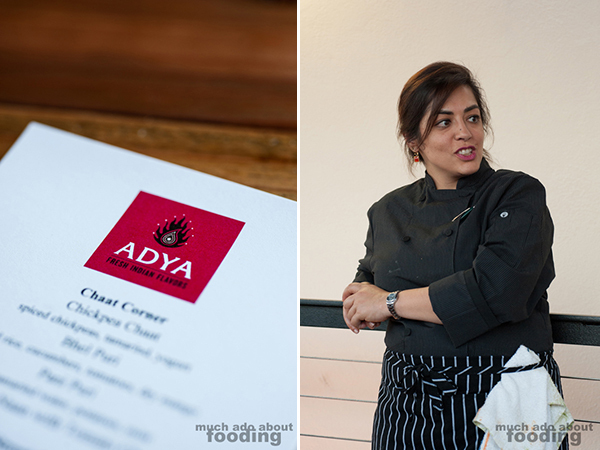 Our hats off to Chef Shachi Mehra for the incredible meal and a hearty congratulations as well to ADYA's opening. Find them at the Anaheim Packing District at 440 S Anaheim Blvd in Anaheim, second floor.